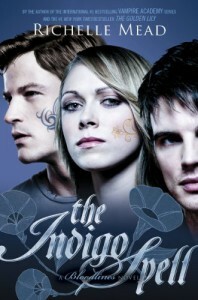 So, The Indigo Spell may or may not have started off last time where I left it, since I read the last book, The Golden Lily almost a year ago. But I do remember really looking forward to this book. I think I enjoyed Sydney the most in this book. My only problems with her from Bloodlines and The Golden Lily was that she was always judging vampires for who they were even though alchemy itself is kind of dependent on the vampires, and it’s not like vampires completely sabotage the human world or anything! Thankfully, in this book, Sydney finally understands that vampires aren’t that bad and that Jill and Eddie and Adrian are all there for her! Oh, yeah, Adrian Ivashkov. He’s really sweet, and to be honest, I see more chemistry (haha, that means Sydney should be able to understand this, too? Right? Sorry, bad joke . . .) in between Sydney and Adrian in this series than I did in him and Rose from Vampire Academy. I think Adrian Ivashkov agrees with me, too. Although there were some predictable parts in this book, I still enjoyed it, nonetheless. I mean, I knew for sure that Sydney was going to come back to Adrian and not go with Marcus because he’s all the way in Mexico and why would she ever leave Jill for that! Fans of Vampire Academy will see some appearances from your favorite characters! This book probably had the best blend of the overall plot, the characters, the subplot, and conflict. And I did enjoy the Adrian-Sydney scenes even if they got to be a little too much at one point. But that’s not a huge problem! Even though I thought that this book was a bit too much on the romance (compared to whatever else is going on right now), I’m glad that it got all wrapped up ad that we didn’t have to go through the three books left in this series of angst, because I do not have the energy for that. Can’t wait for The Fiery Heart and YES I will not read the sequel to this NEXT year. His eyes were on his heart, completely caught up in his work. “Just something kicking around in my head. Reminds me of you. Fiery and sweet, all at the same time. A flame in the dark, lighting my way.” His voice... his words... I recognized one of his spirit-driven moments. It should’ve unnerved me, but there was something sensual about the way he spoke, something that made my breath catch. A flame in the dark. *sigh* Don’t you just love them?